Believe it or not, Jimi Hendrix has a new album of even more unreleased recordings, coming out March 5th, called “People, Hell and Angels” from Experience Hendrix, LLC and Legacy Recordings. But, how can this be?!? The man has been dead for over 40 years!!! He isn’t considered the ‘Greatest Guitarist EVER’ for no reason. 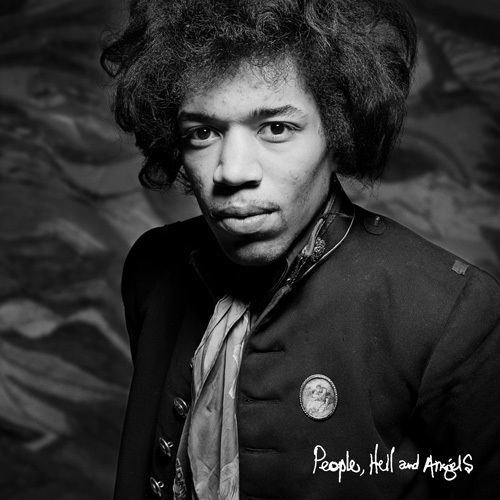 According to The Official Jimi Hendrix website, People, Hell & Angels, showcases the legendary guitarist working outside of the original Jimi Hendrix Experience trio. Beginning in 1968, Jimi Hendrix grew restless, eager to develop new material with old friends and new ensembles. Outside the view of a massive audience that had established the Experience as rock’s largest grossing concert act and simultaneously placed two of his albums in the US Top 10 sales chart, Jimi was busy working behind the scenes to craft his next musical statement. Unlike contemporaries such as The Beatles or Bob Dylan, Jimi Hendrix owned his songs and master recordings. He did not have to record his music at recording studios owned and operated by his record company. Hendrix spent countless hours recording his new music at new, independent music studios such as New York’s Record Plant and the Hit Factory. Hendrix was so focused on recording his music that, concurrent with nearly all of the sessions featured as part of People, Hell & Angels, he was underwriting the construction of his own recording facility–the state of the art Electric Lady Studios in Greenwich Village. You can hear the first track from the forth-coming album, “Somewhere,” exclusively at Rollingstone.com, which this newly discovered gem, recorded in March 1968 and features Buddy Miles on drums and Stephen Stills on bass, is an entirely different version from any previous version fans have heard before. You can pre-order the CD or Vinyl from Amazon and receive $2 off your purchase by using coupon code “HENDRIXJ” until March 4, 2013. Also, you can pick up the album at any awesome independent music retailer on March 5th. Tom Waits and Keith Richards Together on New Record! Bowie Gives Fans Presents on 66th Birthday! This entry was posted on Tuesday, January 8th, 2013 at 2:09 pm	and is filed under Music, News. You can follow any responses to this entry through the RSS 2.0 feed. You can skip to the end and leave a response. Pinging is currently not allowed. « Film Review: ‘Not Fade Away’!